Traveling with photography equipment can be a harrowing experience especially with the airlines imposing increased limitations on carry-on luggage. At UFP Technologies, we offer the full line of Pelican’s waterproof camera cases which have proven to be the ideal choice among professional photographers. 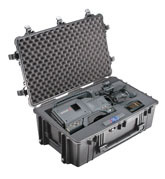 You can learn more about the features of Pelican Cases on our Pelican Case Properties page. Cases are available with four types of inserts listed below. Nearly all Pelican camera cases come standard with Pelican’s easy, do-it-yourself system for custom shaping the interior of the case according to your equipment. Layers of foam are pre-scored in tiny cubes that can be easily “plucked” away. This allows one to easily customize the case for specific cameras and accessories, but once the foam is customized, foam can not be added back. Furthermore, the standard Pick N Pluck foam is made from a foam that is not extremely dense so it is wise to leave 1” to 1-1/2” between items. Padded dividers offer the most flexibility for organizing your supplies and equipment inside your Pelican Case. They are made of durable nylon and foam and come as a standard option with most cases. Velcro® fasteners allow almost unlimited versatility allowing you to change the sizes of each compartment as necessary. 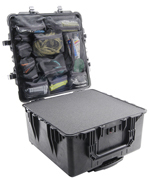 Many Pelican Cases come with optional lid organizers made from waterproof ballistic nylon. The mesh style pockets feature nylon zippers and install with hook and loop strips.